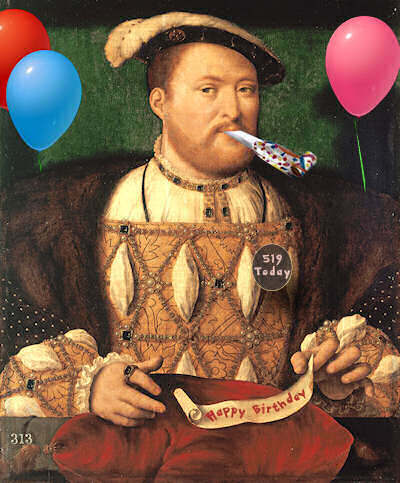 Happy 519th Birthday King Henry VIII! Yes, on this day in history, the 28th June 1491, King Henry VIII was born at Greenwich Palace. He was Henry VII and Elizabeth of York’s third child and second son, the “spare” they needed in reserve in case anything happened to his older brother, Prince Arthur. And he was needed! On the 2nd April, Prince Arthur the Prince of Wales died at the age of 15, just a few months after his marriage to Catherine of Aragon. Not only did Henry inherit Arthur’s position, Prince of Wales, he also inherited his wife! This second son of Henry VII became King of England on the 22nd April 1509 and married his brother’s widow, Catherine of Aragon, on the 11th June of the same year. He ruled for over 37 years and today, over 500 years since his accession to the throne, he is still discussed, debated and is the subject of countless movies, TV shows and documentaries. Love him or hate him, there’ just no getting around the fact that he is one of the most iconic monarchs of English history. You can find out more about Henry VIII in my recent articles – Henry VIII: Renaissance Prince and King and Henry VIII: A Tyrant or Just Misunderstood – and also at our Henry VIII Resources page. Which books would you recommend? Happy Birthday Henry! One thing is certain, you were the most colorful and interesting King in English history. Happy Birthday Henry! You may be 519, but you don’t look a day over forty! :D I love your birthday portrait! Katherine, Thats to funny!! Baroness. What is it about this King that continues to intrigue us after all this time? Especially as flightly and fickle as humanity is in general, yet Henry and his contemporaries obviously strike a chord for many of us. Thanks for the portrait of Henry Claire! Whoops, I need a comma after “Henry” to break up the “Henry Claire”. Happy Birthday King Henry!!! Though I will always have a love-hate feelings for him, but without him we’d never have known Elizabeth I, and that would’ve been a shame. Happy Birthday, Henry…What a life you lead. I wonder who you were reincarnated as, possibly a woman who suffered at the hand of her husband? Karma! I wondered if I would find some way to use the following experience of mine, and now’s the time. Some of you might be interested in the fact that in the 1980s when I was living in California, I met a tall, heavy-set, blond man who had a real presence, quite charismatic, in fact. He worked as a foreign car mechanic, was attracted to an Eastern spiritual path, and with his wife had built his own, very nice home in the Santa Cruz mountains with a vast and grand forested view of maybe 10 miles, all the way to the ocean, with no other houses in sight. When my husband and I were invited to visit the home he and his wife were almost done building, we were impressed. I also noticed two books on the living room coffee table–one on the castles of England, and another a biography of Henry. When I asked, his wife confided that he felt an affinity with Henry VIII (she hinted he felt he might be his reincarnation). This man seemed to be an accomplished, intelligent, friendly enough fellow, and quite sincere and dedicated in his pursuits. However, he did have some significant problems. One, his wife said he had 5 girls by a previous marriage. Apparently he really wanted a son. Two, he was deeply in debt, after just about finishing his dream house (facing bankruptcy in fact) and three, there was evidence of some hidden emotional issues. The large, tiled tub he had built, by hand, into the master bathroom was beautifully crafted, but too shallow–his wife pointed out he had made a mistake in calculating the dimensions, and it just would not comfortably accomodate a person of his size. She said he insisted on making it on his own, with no help from her. Talk about karma! One might expect some self-image problems, just trying to integrate things, I suppose. Maybe feeling he didn’t deserve the comfort? Claire asked for books we would recommend on Henry. For any of you who might be interested in the “afterlife”, and contact with “the other side of the veil” as it used to quaintly be called, there is an obscure book written by a highly respected Anglican priest named Canon Packenham-Walsh, now deceased. His true story details many mysterious and fascinating messages and interactions, through various mediums, involving many of the famous folks from the Tudor period, including Henry and several of his wives, during the early 1900s. It is called A Tudor Story: The Return of Anne Boleyn. Just to tease you, I will say that Henry had to be rescued from a limbo-like deep spiritual slumber, with the help of many of his victims, incuding Anne, who Canon P-W comes to revere. Quick fact: According to Hollinshed, Henry executed about 72,000 people, and that is a low estimate by some authorities. So, it seems he had a bit of repenting to do. Wow the story about the man from So. California is very intriguing indeed. He could very well be the reincarnation of Henry VIII. Has he had a past life regression done? That would be so interesting to find out. I believe in past lives and karma and the fact that you spell your name like Anne Boleyn puts in another validation. If you get any more info, please share. Anne, Sounds like another colorful character living in southern California. Sounds like a typical do it yourself guy – he will never admit to making a mistake. Claire, I love your Henry picture. ROTFL! As much as I don’t want say ,Happy Birthday to the King Of England. Baroness wishes ,King Henry the 8th Happy Birthday.